Bhubaneswar: Honda Motorcycle & Scooter India Pvt. 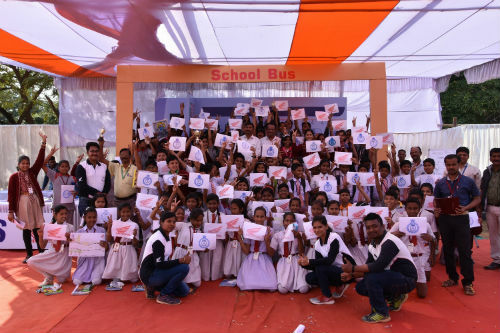 Ltd. conducted the first of its kind, Inter School Bus Safety Competition in Bhubaneswar. This innovative school bus safety workshop saw the participation of students in the age group 9 to 13 and also included participation of bus drivers and conductors. The four-day long activity aimed at educating school students about the significance of safe habits in a school bus. The students were counselled about Boarding, De-Boarding and appropriate conduct inside a School Bus through an interactive session designed to make it a fun-filled activity for school children. 400 school students from across 5 schools of Bhubaneswar, were imparted invaluable lessons of road and bus safety. The School Bus Safety Competition is a 100% fun-learning experience that replicates real-life conditions in a secure environment. It is organized in a 3D mockup bus. The workshop included an assortment of theoretical and practical experiences for kids. A qualifying test was conducted amongst the students, post which ‘Safety Champions’ from each school were selected. The Safety Champions then competed in fun activities including a drawing competition and a quiz on school bus safety. At the end of the workshop, the winners were felicitated with a certificate of excellence for School Bus Safety habits. Honda 2Wheelers India, in collaboration with Bhubaneswar RTO modernized the Road Safety and Traffic Training Park in December 2017. For Honda 2Wheelers India, road safety comes first. Till date, Honda has educated more than 15 lac Indians on road safety. Since then, Honda has adopted a total of 12 traffic parks in Delhi (2), Jaipur, Chandigarh, Bhubaneswar, Cuttack, Yeola (Nashik), Hyderabad, Indore, Ludhiana, Coimbatore and Karnal.